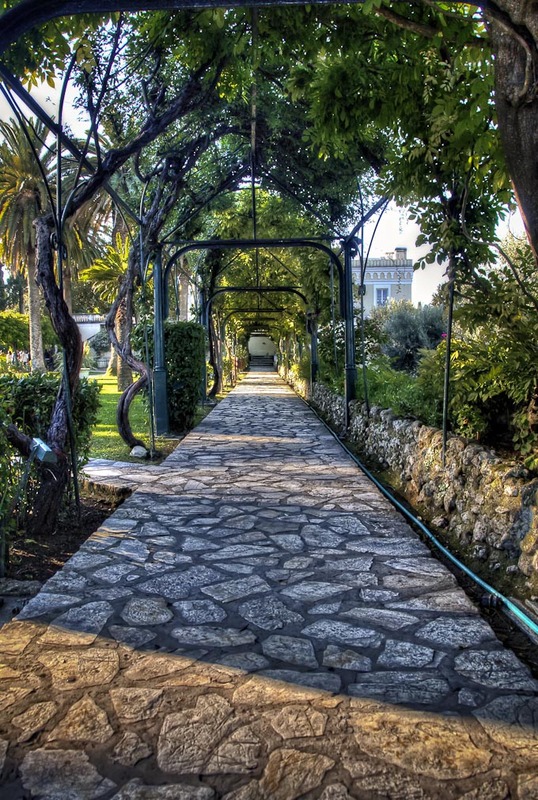 The Achilleion Palace on the island of Corfu, Greece was built in 1890 by the Empress of Austria, Elisabeth of Bavaria. The palace was named and designed after the mythical hero, Achilles. The palace itself is a monument to Achilles with paintings and statues of him throughout the building and its surrounding gardens. The back of the palace is impressive with its checkerboard marble patio that is surrounded by impressive statues. Off to the side of this patio is a terraced walkway that leads to a viewpoint that overlooks the surrounding countryside. This image was taken from the viewpoint looking back toward the palace. It was early morning and the light was streaming through the gardens leaving streaks of light and shadow on the terraced walkway. I was taken with the textures of the stone and wanted to make sure I composed as much of it as I could leading toward the vanishing point of the walkway.